Jeremy Corbyn says his party must "turn our fire outwards", promising MPs Labour will remain a "broad church". Several MPs who have criticised the leader have faced pressure from their constituency parties, and Mr Corbyn has recently been urged by one, Chuka Umunna, to "call off the dogs". Speaking to the Parliamentary Labour Party, Mr Corbyn said there would always be differences of opinion. Meanwhile a motion of censure against one MP has been withdrawn. Canterbury MP Rosie Duffield had been facing the action by her local party over her comments about Labour's anti-Semitism row, but this was later withdrawn at a branch meeting. A spokesman for Jeremy Corbyn said it was "not his place" to get involved in the "democratic practices of different parts of the Labour Party". Last week Labour activists passed no-confidence votes against the Friends of Israel chairwoman Joan Ryan, Luton South MP Gavin Shuker and Nottingham East MP Chris Leslie. Earlier several Labour MPs rallied in support of Ms Duffield after the censure motion was revealed. Very pleased to hear Membership Democracy in action tonight in Cantebury where the motion of Censure against @RosieDuffield1 which was laid at the branch meeting was withdrawn. Thanks to all the members who supported Rosie. 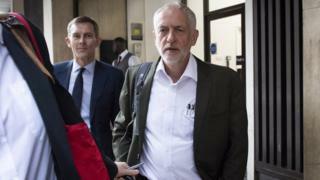 Mr Corbyn told MPs on Monday night: "The Labour Party has always been a broad church and I'm determined it remains so. "We will always have some differences of opinion and we must protect the right of criticism and debate but our first and overwhelming priority is to deliver for the people we represent and remove this Conservative government from office. "We must focus on that priority and turn our fire outwards." On the confidence votes in local parties, a spokesman for Mr Corbyn said he had told MPs that "it is not his place to be involved in the democratic practices of different parts of the Labour Party", the Press Association reported. He added: "He was making the point that everybody is subject to democratic accountability. It's not his role to interfere with that. "But obviously these things have to be conducted properly and thoroughly and without abuse and Jeremy reiterated... that our politics is conducted with respect and without abuse of any kind." Shadow chancellor John McDonnell rejected claims Labour MPs who had criticised Mr Corbyn were being forced out of the party by far left activists. He told BBC Radio 4's Today programme: "I'm sorry, that does not bear relation to reality. "We now have 500,000 members. It's a huge mass party now and, of course, those members want to get involved in discussions about policy. "Also, they will reflect at times their view about the performances of their local MP. "And we have had a small number of incidences that we have seen, two or three, where parties have come together and they have expressed concerns about the performance of their MP. That's happened right the way through the history of our party, but it's nothing untoward."